Coconut burfi is the most loved sweet dish. All over India, people love to relish the taste of coconut in every way. Moreover, products made from coconut are nutritious, healthy and delicious. Be it coconut water or sweets made from coconut, from north India to south India, from west to east India, there is nothing as savory and enjoyable as coconut burfi. Preparing coconut burfi is the easiest task. In fact, it can be prepared in a couple of minutes. So, on the festive occasion of Rakhi, prepare this yummy coconut burfi dish for your brother. Besides, children and other family members would also love to gorge on coconut burfi. 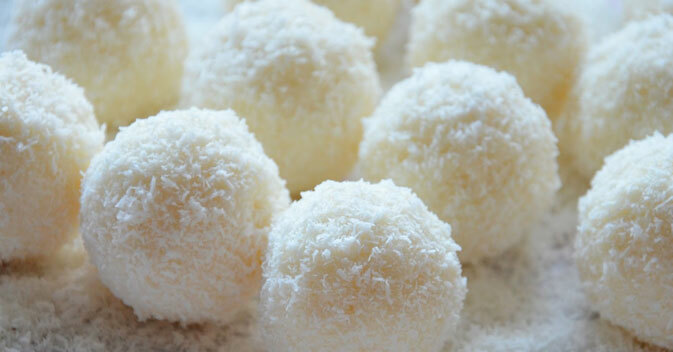 Check out the recipe of coconut burfi at sendrakhi.com. In a non-stick pan, take milk, add sugar and bring it to boil. Then add coconut to it. Let it boil on simmered flame for quite sometime until the milk is reduced to half. But you should keep on stirring frequently to avoid the milk getting burnt. As soon as the milk gets thickened, just like condensed milk, add edible yellow color to it. Finally, after a couple of minutes pour it onto a greased plate. Let it stand for half an hour and cut it in the shape of a barfi. It could be diamond shaped, square or triangle shaped as per your liking. Garnish it with pistachios and almonds. And the coconut barfi is ready!